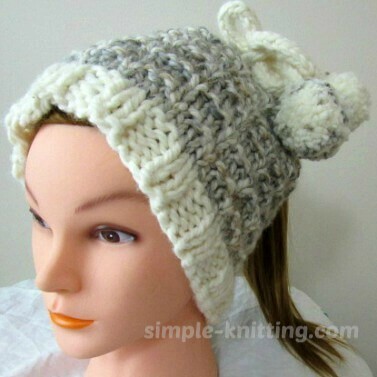 This ponytail hat pattern is a fun and quick knitting project and not only do you get a messy bun hat with this easy knitting pattern, but you also get a cute knitted hat too. With poms poms even. And it's easy enough for beginner knitters too. I love things with a dual purpose don't you? You may even be able to wear this as a neck warmer but I'll let you decide on that after you make it. The really cool part about knitting ponytail hats/messy bun hats is you don't need to do all the decreasing at the crown as you normally would in a regular knit hat pattern. This fun hat pattern is made with thick soft yarn and easy knitting stitches. I wanted to create simple textured stitches so I chose the Double Andalusian stitch pattern. It creates just enough texture and it's still a nice easy quick knit pattern. It also has a larger opening at the top so it will be great for large messy buns. Notes: I used two colours for my pony tail hat but you can use one if you like. This easy hat pattern is knit flat and can be done in a couple of hours which means you can knit up a whole bunch in different colors. Work pattern rows 1 – 4 until your work is approximately 8.5 inches from beginning. Knit 2 more rows of ribbing and bind off loosely. There are a couple of ways you can make a tie for the top of the hat. Either make an I-Cord tie or you can simply crochet a chain or even use a nice ribbon. If you aren’t sure how to crochet a chain I’ve included a video just below my pattern. Be sure to make the tie long enough to weave through the holes at the top of the hat and cinch it closed. Add pom poms if you wish or even beads, weave in the ends and you're finished knitting your ponytail hat and knitted hat all in one.